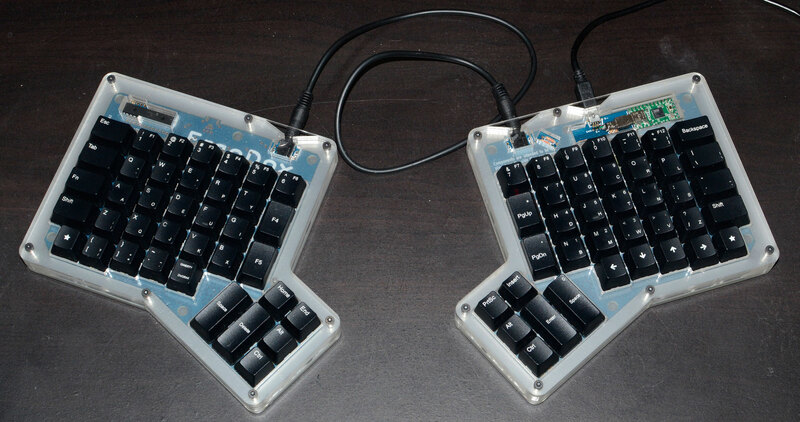 It's a split-hand ergonomic, n-key rollover, reprogrammable, open source keyboard with mechanical switches. The nature of the beast is that the plans are available online, but you have to source the parts and assemble it yourself. Therefore, you cannot buy one of these in the shops. It arrived the other day, but long story short, I'm not sure if I want to keep it (long story below). I haven't assembled it yet, so you don't have to trust someone else's soldering skills. Basically to source all the parts separately, you'd be looking at at least $500-600; the switches alone would cost you $170 let alone the custom PCB, machinied case, keycaps, and all the miscellaneous electronic parts. The one I have includes Cherry MX Clear switches and blank semi-opaque smoke coloured keycaps. I'm looking for $350 which includes postage to wherever you are. If anyone's interested, let me know. Long story: I'm generally interested in open source software, and my interest was piqued a few months back when I heard about some free open-source software that allows you to learn and use stenography (you know, like the people who type down everything on those little machines in court) on a regular windows machine, as long as you have an NKRO keyboard. Stenographers can get upwards of 200 wpm, so I was interested in the idea of being able to finish s*** I didn't want to be doing twice as fast as I otherwise could. Fast forward and I ended up buying an Ergodox kit. At the time I didn't realise that proper used steno machines (the student ones anyway) can go for not a lot more than what I'm asking here. Also, I'm considering it potentially as a career. Those captions you see on TV? Yeah, those people make bank. So, yeah, rather than stressing over putting it together (electronics novice) I'm thinking of selling it and getting an actual stenography machine from the US.